Weblog je součástí portálu AKA MONITOR ISSN 1804-042X, oficiálního partnera Západočeské univerzity v Plzni. Monitoring webových zdrojů, knih a časopisů. www.akamonitor.cz. Dvě prezentace ( 1 a 3 ) jsou při tom vystaveny v doméně na a2hosting a jedna (2) v mé doméně. Na stránce tohoto weblogu jsem se již několikrát zmínil o knize Chrise Leedse s výše uvedeným názvem. Knihu vydal Microsoft Press. Objevil jsem ji zatím pouze v angličtině. ( Kniha věnovaná verzi 2 Expression web vyšla i v češtině ). S využitím vybraných částí textu knihy jsem sestavil tuto recenzi. Last segment of this book explains the newest feature in Expression Web 4: Search Engine Optimization (SEO). In this book, you can see several reports that are available in Expression Web 4, but the SEO Reports feature is new and unique among HTML editors The SEO Reports feature enables designers and developers to give a sort of “prefight” inspection to their sites and pages from a perspective of attaining the highest possible Search Engine Results Page position (SERP). With SketchFlow, you can sketch and quickly prototype applications, including all interactivity. You can create a working “initial prototype” of an application, without writing any code, thus improving productivity and letting you experiment with multiple ideas. You can import scanned paper sketches, use the power of sample data, include built-in navigation between screens, switch between states, and add animations so that you and your clients can test how the prototype behaves. a) Often, your ideas are born on scraps of paper or napkins and are nothing but pencil sketches. All of this sketching becomes the first draft of your idea. But the idea is still on paper and looks static. Prototyping adds life and functionality to your idea; you can feel how buttons click and how and when screens change, you can preview sample data in lists and fill out forms, and more. After a prototype is finalized, it’s much easier to create a real application because almost all of the interactive parts of the application—the screens, the elements, the behaviors, and the parts—are polished and integrated. Every screen in your prototype appears as a node in the SketchFlow Map panel. The connections between these nodes simulate the navigation. You can have both connected and unconnected screens in a SketchFlow application. b) The SketchFlow Map panel displays two types of screens: navigation and component. Component screens are similar to navigation screens but contain content that you can reuse on multiple screens. A component screen can also be part of a navigation screen. You can organize content that you want to reuse on multiple screens into component screens. c) Adding new controls to your SketchFlow application is similar to adding them to other applications. The difference is that controls in SketchFlow prototypes have a hand-sketched look and use special Sketch styles. Microsoft chose the Sketch style for controls to help users focus on ideas rather than appearance at this early stage of the application design process. At the prototype stage, you should concentrate on thinking and experimenting with ideas, and postpone skinning for the next phase of the application’s development. d) The process of adding new controls to a prototype is simple and fast. Even if you directly write or copy XAML code to add elements, you can apply Sketch styles later from the Resources panel or by using the Expression Blend breadcrumb bar at the top of the Artboard. You can also remove the Sketch styles to use the default Silverlight and WPF appearance of controls. e) In Sketchflow you can use Sample data. The main purpose of sample data is to quickly fill prototype applications with temporary but realistic data. At this prototype stage, you should concentrate on ideas, not on production data. You can fill your completed application with real data later, at the appropriate point in the development cycle. f) When you design an individual screen for a prototype application, you can also draw by using Expression Blend’s vector tools, scan paper sketches, or import graphic assets from Microsoft Expression Design. Additionally, you can use the custom shapes from the Assets panel. The shapes also have Sketch styles appropriate for use in SketchFlow projects. There are intended to help designers and viewers focus on the interactive design of the prototype rather than the visual design. You can create a hand-sketched look for images and photos you use in prototype applications. g) SketchFlow provides tools for creating true interactivity and for simulating it. Applying behaviors to elements in your prototype, using states to switch between different scenes, and adding specific navigation to elements all enable you to include real interactivity. Simulated interactivity works by using animations instead of behaviors. In a real application, screens change when users press buttons, select something from a list, enter data in fields, and so on. Providing these interactive features enables users to interact with UI elements much as they would in the finished application. It is possible to use the states model for screens when you are designing a prototype application. States help to demonstrate interactivity and can help provide different design alternatives for a single screen. Adding animation between the various screen states provides additional realism. h) You can customize the SketchFlow Player runtime environment by changing the SketchFlow project settings. You can customize the branding area to suit your needs: enter a new title for a project, add versions, or include a custom image by using special tags. i) When the prototype application is finished, or when it reaches one of the final phases, it is possible to show it to friends, colleagues, team, or customers. Creating a SketchFlow package enables to include all the required files to view the project without source files, making it easy to share with others. j) While viewing the prototype, friends, colleagues, team members, or customers might want to provide comments or feedback. The feedbach is a valuable way how to informa users about what they liked, about needed changes or missing features, and so on. By collecting these comments, it is possible to improve the prototype to make the final application better before investing the work to build the final application. 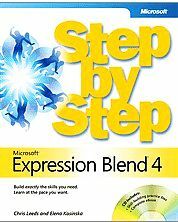 MS Expression Blend 4 according to the authors of the book "Microsoft Expression Blend 4 Step by Step"
Chris Leeds and Elena Kosinska are authors of notable book published by Microsoft Press. For the short intruduction to MS Expression Blend 4, I would like to take advantage of the characteristcis given in their book. 5 Animations and Transformations . Here is the characteristic of MS Expression Blend 4, by the author of the book „Microsoft Expression Blend 4 Step by Step“, Ch. Leeds and Elena Kosinska. The book, writen by CH. Leeds and E. Kosinska, is intended for existing or new User Interface/User Experience designers, developers, and design integrators, as well as those who needsome basic knowledge of the tools and capabilities used by designers. Although the book is expressly intended to provide information and step by step examples for new designers, experienced practitioners can use this book as well, to quickly gain familiarity with the Expression Blend 4 user interface and features. Expression Design for Developers - Postes by Joel Cochran - portál "developingfor.net"
Expression Blend, který výstup z programu Design využívá. Text je rozdělen do 4 částí, které byly publikovány postupně. Obsahují základní charakteristiku MS Design (ve srovnání s produkty společnosti ADOBE - Ilustrator, inDesign, Photoshop ). Možnosti využití Expression Design prezentuje autor na dvou ucelených příkladech. Zde jsou uvedené 4 části textu, společně s webovými adresami jednotlivých částí. Text může být zajímavý především pro vývojáře aplikací, kterým je prioritně určena poslední, čtvrtá část, věnovaná dvěma tématům: Layers a Export do XAML. Rozsah článku je cca 20 starn ve formátu Wordu. XIX. ročník konference Systémová integrace - 5. a 6. 6.2011. Dovoluji si připomenout blížící se tradiční svátek všech informatiků, jejich manažérů i uživatelů ICT. Pořadatelem devatenáctého ročníku konference je opět Vysoká škola ekonomická, společně s organizacemi: Česká společnost pro systémovou integraci, CACIO, ISACA, SoSIReČR a SSSI. Devatenáctý ročník mezinárodní konference "Systémová integrace 2011“ je zaměřen na zvýšení výkonnosti soukromého i veřejného sektoru v ČR pomocí ICT. Úvodní přednášku na téma "Strategie konkurenceschopnosti ČR" přednese Jan Švejnar (CERGE). 1) přednášky 2) workshopy a 3) případové studie. Program bude doplněn o presentace nejlepších projektů ICT oceněných v soutěži „IT projekt roku“. Konference se koná ve dnech 5. a 6. června 2011 v prostředí paláce Žofín na pražském Slovanském ostrově. Můžete použít Zoom i Move ( levé tlačítko myši a kolečko ). Komplexnější ukázky vám zpřístupní Google. Deep Zoom can be used in many different areas, but there are three key scenarios where Deep Zoom is particularly useful. Source of the text: MSDN. - Exploration of Very Large or High Resolution Images: A classic example of this would be zooming in on parts of a large map to see different levels of detail and then, using the mouse, moving your view around the map surface. As the user moves their view, animations are used to give the user the impression that they are "moving" from one place to the other on the image. Another example would be exploring a professional photo composition made up of high-resolution pictures. - 3-D Photography: Take pictures of a room, one after the other, creating a collection of photos that make up a 360 degree picture of the room. Now the user can pan around the room with each photo blending into the other. - Advertisements: You could create a relatively low-resolution image to represent the overall theme of the ad, and then have progressively higher resolution images containing more impressions and data about the product. When the page the ad is embedded in first loads, the ad smoothly sharpens and draws the attention of the reader by loading subsequently higher resolution images. Since the ad progressively loads, it does not significantly impact the user's overall experience of the site. In addition, if the user's mouse enters the ad, different parts of the ad can zoom in. - A deepzoom primer ( explained and coded)..
Na dole uvedené adrese najdete slideshow-review pozoruhodného programu nabízeného Microsoftem. Deep Zoom Composer is a free tool from Microsoft for creating complete Deep Zoom experiences. It can create Deep Zoom Images (DZI) for both Seadragon Ajax and Silverlight Deep Zoom and Deep Zoom Collections (DZC) for Silverlight Deep Zoom, as well as complete Silverlight Deep Zoom or Seadragon Ajax viewers and associated web pages. Deep Zoom provides the ability to interactively view high-resolution images. You can zoom in and out of images rapidly without affecting the performance of your application. Deep Zoom enables smooth loading and panning by serving up multi-resolution images and using spring animations. Jednou zvou nových funkcí 4 verze MS Expression Web je SEO Reports, nabízející designerům a vývojářům rychlou revizi jejich stránek s ohledem na šanci dosáhnout nejvyšší možné hodnoty SERP ( TheSearch Engine Results Page position). Ukázka prostředí na dole uvedené adrese. SEO Reports features enables designers and developers to give a sort of "preflight" inspection to their sites and pages from a perspective of attaining the highest possible Search Engine Results Page position. ( Chris Leeds ). ASP.NET je výkonná technologie Microsoftu určená pro vytváření webových aplikací běžících na straně serveru. V názvu publikace je uvedeno “KNIHA 1”. Je to proto, že boharství poznatků, které s daným tématem souvisí, přesahuje možnosti jednoho svazku. Publikace byla rozdělena do dvou snazků, při čemž první svazek obsahuj všechno, co potřebujeme ke zvládnutí ASP.NET 4 a C# 2010. První svazek je vhodný zejména pro uživatele, kteří v ASP.NET dosud neprogramovali. Kniha čtenáři nabízí vhodné tempo výuky, umožňující v krátkém čase projít všechny základní věci, které je potřeba znát v každodenní vývojářské praxi. - Základy ASP.NET (úvod do ASP.NET, Visual Studio, webové formuláře, serverové ovládací prvky, aplikace ASP.NET, správa stavu). - Přístup k datům (základy ADO.NET, datové komponenty a sada dat, vázání dat, bohatě vybavené datové ovládací prvky, cachování a asynchronní stránky, soubory a proudy, LINQ, XML). - Budování webů ASP.NET (uživatelské ovládací prvky, motivy a vzory stránek, navigace po webu, nasazování webů). - Bezpečnost (bezpečnostní model ASP.NET, ověřování založené na formulářích, členství, ověřování systému Windows, autorizace a role, profi ly, kryptografi e, vlastní zprostředkovatelé členství). Pohodlnému zvládnutí látky napomáhá spousta praktických příkladů a technik z reálného světa. Na webové stránce knihy na portálu Zonerpress, si můžete stáhnout všechny praktické příklady. Pro bližší představu o přístupu autorů k danému náročnému tématu, si můžete udělat na základě obsahu dvou bonusových kapitol, které jsou rovněž ke stažení a to v plném znění. Je třeba řici, že kniha není zrovna ( snad s výjimkou zkušených profesionálů ) vhodná pro čtení u kávy. Zkušení autoři nám však svým přístupem studium usnadnili v maximální možné míře. Kniha ZonerPressu je vzácný kus odborné literatury, který by určitě neml chybět v knihovně žádného programátora dynamických webových stránek. Knihu vřele doporučuji všem náročným programátorům. Jednou z naléhavých podmínek rozvoje obsahu internetu je nejen snadná tvorba obsahu, ale v nemenší míře i snadná péče o aktualizaci obsahu. Tvorba a editace webových stránek, jako nositelek obsahu internetu mají mnoho společného. Nový obsah stránek vzniká z velké části editací původního obsahu stránek. Mnoho nových stránek vzniká kombinací obsahu existujících stránek s nově vytvářeným obsahem. Klasickými nástroji pro tvorbu a editaci webových stránek jsou nástroje typu MS FrontPage, MS Expression web ( součást MS Expression Studia ) a jejich alternativy o dalších dodavatelů. Editace a doplňování obsahu stránek se děje převážně off-line s následnou publikací nové verze. Přístup ContenSeeds je pozoruhodný m.j. tím, že tvorbu a aktualizaci webových stránek v režimu LIVE Editing nabízí nejen uživatelům - správcům stránek, ale ( v přesně stanoveném režimu ) i klientům firem spravujících stránky. - rozhodující úloha v aktualizaci stránky přísluší on-line ( seed ) editoru. - uložením nového/aktualizovaného obsahu dochází bezprostředně k úpravě webové stránky zobrazené v prohlížeči. Funkce MultiSeed umožňuje aktualizaci obsahu v několika místech téže stránky. Funkce QueryString umožňuje vytvářet webové sídlo ( množinu propojených stránek ) pomocí jediné webové stránky, využívající připravené komponenty. Velkou výhodou ContentSeeds je možnost využití na libovolné platformě a při editaci-aktualizaci webových stránek pomocí obsahu různých formátů. S prostředím a s funkcemi ContentSeeds je možné se seznámit buď na stránce firmy MediaCarbon, nebo využitím mé prezentace-recenze ( slideshow-review), kterou najdete na adrese: www.akamonitor.cz/product-reviews/contentseeds / . 4.dubna 2011 vychází kniha dvojice autorů Eleny Kosinské a Chrise Leedse, věnovaná MS Expression Blend 4 Step by Step. Knihu vydal Microsoft Press. S knihou se můžete rámcově ( v režimu PREVIEW ) - seznámit již nyní pokud využijete on-line službu Oreilly - SafariBooksOnline. Služba je dostupná v placené i ve FREE Trial verzi. najdete odkaz "Start your free trial". Po přihlášení zedejte nabídku SEARCH, v rozbalovacím menu zvolte Books/vidos a jko klíč zadejte "Blend 4 step". V modu Preview je dostupný Obsah, uvod a velká část knihy - některé stránky pouze částečně, některé plně. Služba "Safaribooksonline" je v plném ( placeném ) modu automaticky přístupná pro ty. kdo knihu ( obsahující kupon s kodem ) zakoupili. Po datu oficiálního vydání ( v případě této knihy po 4.4.) bývá volně přístupný i ZIP soubor obsahující příklady obsažené v knize. Editor Authentic od firmy ALTOVA je wysiwyg editor. Vyskytuje se ve dvou verzích. Následující informace se týká verze, která je poskytována ke stažení zdarma. Bohatěji vybavená verze Enterprise, je placená. "Altova Authentic® 2011 Community Edition is a FREE WYSIWYG content editor that allows non-technical business users to view and edit data in XML documents and relational databases without being exposed to the underlying technology. They simply fill in electronic forms using the word processor-style interface, and their content or query is instantly processed. Authentic is ideally suited as the user interface element of XML-based document frameworks and management-oriented databases." Free verzi mám odzkoušenou a mohu ji proto doporučit. Verzi Enterprise nainstalovanou nemám, takže zatím se nemohu vyjádřit k otázce zda se investice do této bohatší verze vyplatí či nikoliv. Podaří-li se mi ji získat, rád se o zkušenosti podělím. Creation - Publication - Feedback. Ukázka tvorby prototypu projektu v MS Sketchflow, na cvičném příkladu propojení slideru a text boxu. Tvorba, publikace i zpětná vazba je prezentována pomocí slideshow, zachycující postup práce. V ukázce se uvádí i upload do prostředí SharePointu. Na téže adrese si můžete spustit „ Arturo’s introductory video“. "To see SketchFlow in action and better visualize the way SketchFlow can help you in your development cycle." „What is SketchFlow? How does it help me? How does SketchFlow work?" - Rapidly create multiple conceptual ideas, saving time and money in the early stages of a project. - Pitch for projects that previously would not have been cost effective to approach. - Delight clients with the speed and quality of the interactive and dynamic prototypes you canpresent to them. - SketchFlow enables you to highlight navigation and application flow issues early in thedevelopment cycle helping you and the client save time and money. - Traditionally prototypes are redundant after the concept phase and discarded. SketchFlowenables you to leverage all the assets and resources you created. In some cases you can evenuse the SketchFlow prototype as the starting point for your production project. - Rapidly evolve prototypes by utilizing the full functionality of Expression Blend 3. There is no limitto the scope of a prototype. From a simple wireframe to examples that are fully data driven andhigh fidelity, a prototype can be as real as a project or client demands. - Empower your client. Their ability to feedback immediately via the SketchFlow player enables theclient to feel an integral part of the process. This ensures the rapid iteration of ideas and avaluable open two way dialog between you and your client. - The flexible workflow of Expression Blend and Visual Studio enable you to extract the bestperformance from a team with everyone continuously working to their respective strengths. - Deliver compelling, cutting edge solutions, in rapid time and on budget to your clients.